Have you considered securing a Felda holiday package? It's easy with Expedia, and you'll be able to buy some nice meals or souvenirs for your friends back home with the cash you save. Secure your package deal on Expedia and save as much as 55%*. With just a few clicks, you can organise everything you'll need for your next holiday through our enormous database. And — with more than 400 partner airlines and 321,000 properties from all over the world, you'll have the freedom to be fussy! Don't worry about altering your plans, as we don't charge additional cancellation fees for almost all of our reservations. Feeling excited about your trip to Felda? Keen for some suggestions about what to see when you arrive? That's what we're here for! It's no secret that leading a healthy lifestyle is good for us, so why not exercise and have a great time at Veterans Park? Its selection of facilities and activities are engineered to benefit both the body and the mind. Adventurers have heaps of options close by. If you'd like to take some strokes off your scorecard, then head over to Mirror Lake Golf Course. Grab your clubs, work on your technique and talk to the friendly locals in the clubhouse. Still got some time to spare? The intimacy and artistry of live theatre has to be experienced. Buy your tickets for a show at Firehouse Community Theatre and experience its charm for yourself! Sadly, there aren't many accommodations to choose from in Felda. The LaBelle Motel (170 West Hickpochee Avenue) is the only Expedia-listed property close by. Check in and make your way through security, board the aircraft, check your boarding pass for your allocated seat and settle in! Your exciting trip to Felda is only a plane ride away. After the wheels touch down at Southwest Florida International Airport (RSW), you'll find yourself situated 19 miles (31 km) from the centre of town. Located in the heart of Lehigh Acres, this hotel is 0.8 mi (1.3 km) from Lehigh Acres Welcome Center and 1.7 mi (2.8 km) from Veterans Park. Jim Fleming Ecological Park and Mirror Lake Golf Course are also within 6 miles (10 km). 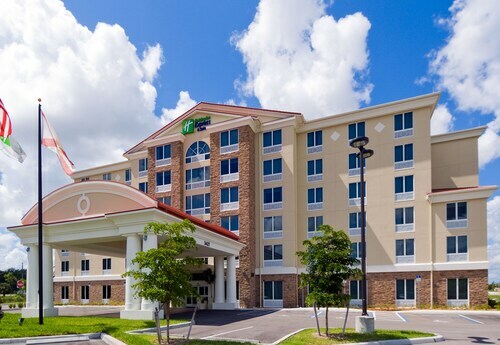 Situated in Fort Myers, this hotel is within 9 mi (15 km) of Imaginarium Hands - On Museum, Centennial Park and Manatee Park. Edison Mall and Edison and Ford Winter Estates are also within 9 mi (15 km). Situated in Fort Myers, this hotel is 1.2 mi (1.9 km) from Lee Cancer Care Center and 1.4 mi (2.3 km) from Calusa Nature Center and Planetarium. Fort Myers Country Club and Six Mile Cypress Slough Preserve are also within 6 miles (10 km). Situated in Fort Myers, this hotel is close to Lee Cancer Care Center and Calusa Nature Center and Planetarium. Area attractions also include JetBlue Park at Fenway South and Fort Myers Country Club. 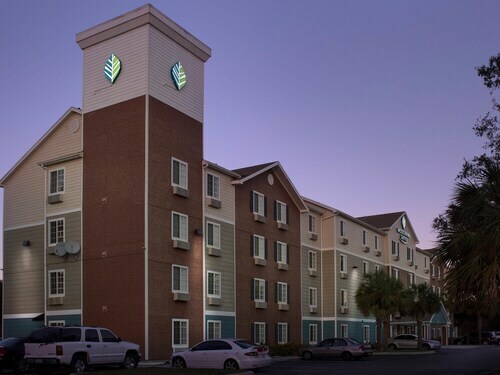 Situated in the business district, this hotel is 1.6 mi (2.6 km) from Manatee Park and within 6 miles (10 km) of Centennial Park and Lee Civic Center. Burroughs Home and Florida Repertory Theater are also within 6 miles (10 km). This family-friendly condominium resort is in the centre of Lehigh Acres, within 20 mi (32 km) of JetBlue Park at Fenway South, Butterfly Estates and Gulf Coast Town Center. Centennial Park and Manatee Park are also within 20 miles (32 km). Situated in Fort Myers, this hotel is 1.5 mi (2.4 km) from Manatee Park and within 6 miles (10 km) of Centennial Park and Lee Civic Center. Burroughs Home and Florida Repertory Theater are also within 6 miles (10 km). 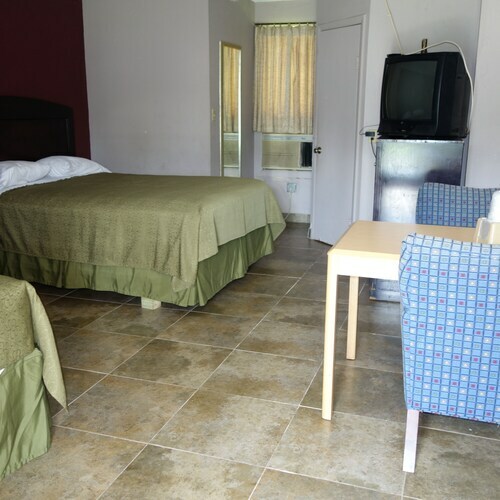 Situated in Fort Myers, this motel is 3.1 mi (5 km) from Manatee Park and within 6 miles (10 km) of Centennial Park and Edison and Ford Winter Estates. Burroughs Home and Florida Repertory Theater are also within 6 miles (10 km).